A week or so ago I went along to the Whitechapel Gallery in London for their screening of a new film by Lynn Hershmann Leeson documenting the feminist movement in 1970s United States. 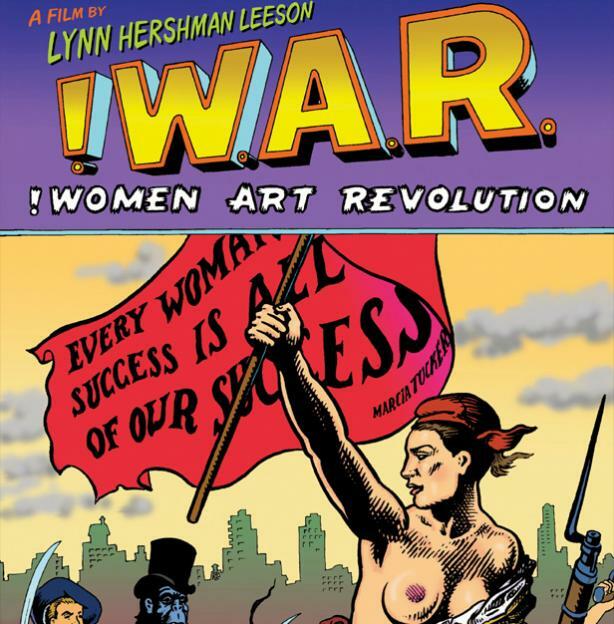 Spanning forty years of material, the film includes interviews with Marcia Tucker, Judy Chicago, Joyce Kosloff and Francesca Woodman amongst countless other women (and one lone man). The eye-catching, rather tacky graphics and rousing all-American music might have cheapened this confident manifesto for the visibility of women artists, but for its invaluable content. The film offers a uniquely complex and personal portrait of the women involved in the 1970s revolution and their interrelationships. It well portrays the passion and intellectual rigour behind the body politic and some of the more subversive artworks of the period, which are at risk of losing their power by becoming meaningless icons of the movement, artefacts of a past movement. In a discussion after the film with Hershman Leeson, Griselda Pollock spoke of the need for the ‘real’ history of the past seventy years to be well documented and collected into a framework from which students can choose to select sources. It wasn’t so much about finding more women in museums, she argued, but rather about having available resources which students today can draw from. Hershmann Leeson agreed: ‘it is easier for historians to put works away in drawers rather than get to grips with the essence of them. The film’s aim is to push the drawer open’. Hershmann Leeson's project RAWWAR, in extension of the ideas and aspirations of the film, is a fantastic resource in pushing the drawer wide open. It not only brings together video clips, slides, and interviews from the past, but, in collaboration with youtube, it enables visitors to upload their own material to the site, ensuring its continuation and constant reinvigoration for the present and guaranteeing its documentation for the future. Yesterday the London Evening Standard announced the first winners of their Ideas for London competition, in collaboration with ArtAngel, a commissioning body for contemporary artists to create a plethora of brilliant projects and probably my dream workplace. I hadn’t heard of the competition before – I’ll now follow its progress. But the proposal of one winner to tackle the tens of thousands of empty houses in London reminded me of another ArtAngel-funded project I went to see three years ago : Roger Hiorns’s astoundingly original Seizure, which should have earned him the 2009 Turner Prize (he was the clear winner in my eyes that year but somehow lost out to Richard Wright, which I will have to discuss in a later post). I went to see Seizure on the last weekend it was open to the public. 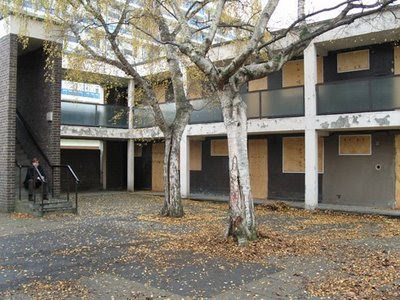 It was easy to find in spite of the unconventional location - a constantly self-replenishing queue of over a hundred people snaked through a run-down courtyard, disappearing into what appeared from the outside to be a small council estate with boarded up windows. The exterior revealed nothing of what was inside. 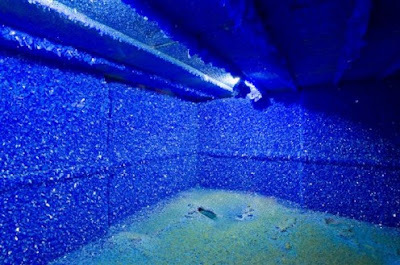 Hiorns had sealed off every edge of the domestic space and filled it with liquid that slowly drained to leave a thick, even carpet of blue copper sulphate crystals bristled from every wall of the tiny council flat. A dado rail coursing around the walls and a bath in an adjoining room were the only hints to the domesticity of the original building. 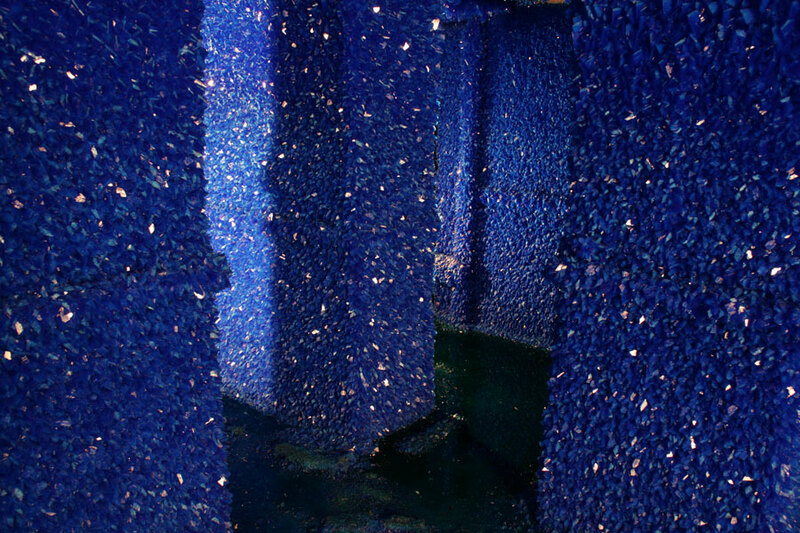 Visitors, picking their way gingerly across the uneven floor, took care not to knock the seemingly delicate crystals but they were unexpectedly hard. 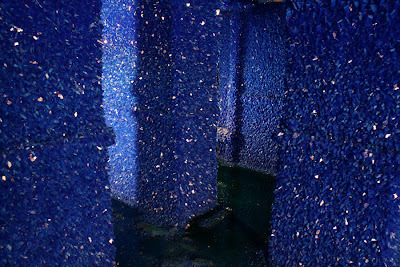 With this knowledge of the piece’s tactility and durability, the space suddenly became less of a romantic or fairytale grotto as some critics called it but a natural environment in itself; the crags and peaks of the crystals were like mountains in miniature, all in an incredible, dark acidic blue. ArtAngel’s support this year of a social project to bring empty properties back to use draws interesting parallels with their commissioning of Hiorns’s aestheticising of an abandoned property, and rendering it absolutely uninhabitable. I’d like to know what has happened to the crystals of Seizure – maybe I’ll try to revisit it. A thick dark line cuts through the small frame of landscape, a strong, palpable presence bisecting the screen. It silently falls to the ground – oh! it was only a log, balanced precariously on end. We watch as the artist, with some effort, heaves the log to its original verticality, and calmly steps back. Suddenly the strength and presence of the line has diminished; we now know the brevity of its equilibrium, and its powerlessness against the elements, here captured in Bill Bollinger’s 8mm film Movie. Weight seems to be an interest of Bollinger’s, who was trained in aeronautical engineering, and his understanding of physics informs his work in unexpected ways. The weight of some pieces is almost tangible: a rusty, industrial barrel holds a well of stagnant water; elsewhere, three slim bands of aluminium seem to lightly skim the walls with their seamless joins and flawless surfaces. Truncated rubber pipes half full with water sit unceremoniously on the floor, oddly steady in their cast iron brackets but always with the potential to tip, and to spill. Downstairs, the gallery space holds together like a sparse workshop of experiments in process. A rope ties together two points on the floor, another measures floor to ceiling. 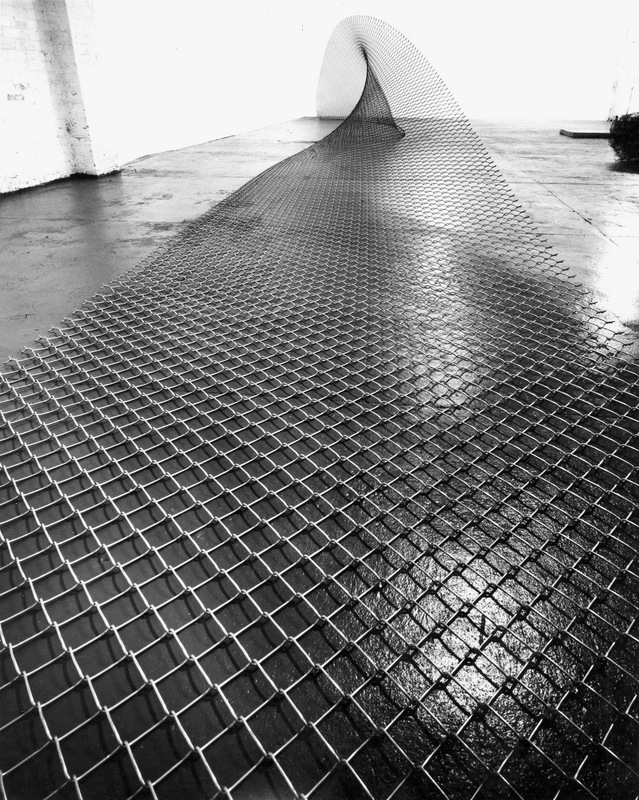 The architecture is pulled together and is given relationships that are superfluous to its structure, and although connected to the surfaces of the room, the ropes seem to reference nothing but themselves; the arbitrary, meaningless pulling taut of elements that exist only for the pleasure of their materiality. Two measures of industrial piping sit isolated in a corner of the room. The unadorned practicality and clean linear finish of these materials might have us seek their functionality as ‘finished’ products but it is a fruitless search. Their curiously insignificant form works against their suggested gravity and purpose. There is no pretention, no unnecessary imposed elevation of the direct, unassuming pieces. Without plinths or barriers, the space is open to exploration of these raw artefacts. Cyclone Fence sits differently against the rest of the exhibition. Like a great Hokusai wave, this swathe of wire fencing stretches languidly across the floor of the gallery’s upper level, twisted into a gracefully swooping arc. I immediately sought associations beyond its plain physicality: its empty squares become the scales of a fascinating fish or snake, which seems to move as you encircle it as the mesh widens and tightens. It is almost too beautiful for the rest of the exhibition; it is supple and alive against the surrounding lifeless forms. And yet, its fluidity serves as a revitalizing counterpoint to the starkly elemental works around it. The tension of the undisturbed surfaces of water in his pipes and barrel and the soundless plummet of the weighty log in Movie echo this opposition: though seemingly constant in their pure physicality, Bollinger’s works are subject to change and make no claim to of immortality. The appealing honesty of his raw materials makes the exhibition a countercultural calm away from the spectacles of modern life.